In April 2013, Senators Sherrod Brown (D-OH) and David Vitter (R-LA) introduced the first bipartisan legislation aimed directly at putting an end to "too big to fail" financial institutions and preventing future bailouts of America's behemoth banks. This is a summary of the “crimes” listed in this article. Source citations can be found in the subsections below. Note: There have not been any known criminal charges relating to these activities. Some are civil cases brought under a legal theory of tort and/or breach of contract and some are enforcement actions brought by administrative agencies such as the SEC or FEC but are not formal criminal charges against the banks. Listed below are the recent settlements made by big financial institutions for their activities that may have significantly contributed to financial crisis of the late 2000's. These settlements were reached due to enforcement actions of government agencies such as the Securities and Exchange Commission, the Federal Trade Commission, and the U.S. Department of Justice, as well as by class action lawsuits brought by investors, organizations, governments, and others who had been harmed by the banks' illegal activities. Wachovia Bank was acquired by Wells Fargo in 2008. The Securities and Exchange Commission charged Wells Fargo’s brokerage firm and a former vice president for selling investments tied to mortgage-backed securities without fully understanding their complexity or disclosing the risks to investors. The SEC found that Wells Fargo improperly sold asset-backed commercial paper (ABCP) structured with high-risk mortgage-backed securities and collateralized debt obligations (CDOs) to municipalities, non-profit institutions, and other customers. Wells Fargo did not obtain sufficient information about these investment vehicles and relied almost exclusively upon their credit ratings. The firm’s representatives failed to understand the true nature, risks, and volatility behind these products before recommending them to investors with generally conservative investment objectives. Wells Fargo agreed to pay more than $6.5 million to settle the SEC’s charges. The money will be placed into a Fair Fund for the benefit of harmed investors. The Department of Justice filed the second largest fair lending settlement in the department’s history to resolve allegations that Wells Fargo Bank, the largest residential home mortgage originator in the United States, engaged in a pattern or practice of discrimination against qualified African-American and Hispanic borrowers in its mortgage lending from 2004 through 2009. The settlement provides $125 million in compensation for wholesale borrowers who were steered into subprime mortgages or who paid higher fees and rates than white borrowers because of their race or national origin. Wells Fargo will also provide $50 million in direct down payment assistance to borrowers in communities around the country where the department identified large numbers of discrimination victims and which were hard hit by the housing crisis. A class of investors sued alleging "Wachovia's Offering Materials materially and repeatedly misstated and failed to disclose the true nature and quality of Wachovia's mortgage loan portfolio, and materially misled investors as to the company's exposure to tens of billions of dollars of losses on mortgage-related assets," according to the Amended Class-Action Complaint. Press Release: NEW YORK - Kirby McInerney LLP has announced the $75 million settlement of a securities class action lawsuit, led by KM on behalf of the New York City Pension Funds, against Wachovia Corporation. Plaintiffs alleged that the Company and its executives misrepresented and failed to disclose Wachovia's exposure to the subprime market, including the deficient underwriting standards of Golden West, a California-based mortgage lender that Wachovia had recently acquired. Prior to October 2007, CEO G. Kennedy "Ken" Thompson continually represented that Wachovia did not have material exposure to subprime-related assets. However, in January of 2008, Wachovia announced that the company had $6.694 billion in total subprime-related exposure. Then, on July 23, 2008, Wachovia announced a second quarter loss of $8.9 billion and cut its dividend by eighty-seven percent to five cents a share. It is estimated that Wachovia's malfeasance caused billions of dollars of losses to investors. Wachovia had made numerous statements assuring its shareholders that Golden West's loans were low risk when in reality Wachovia was or should have been aware that the company had not been following underwriting and loan-origination practices. Wachovia, moreover, had been unable to confirm the credit-worthiness of the loan applicants on a significant portion of the Pick-A-Pay loan program, which was Golden West's primary loan product. Wachovia also did little to verify the income of applicants applying for Pick-A-Pay loans. Moreover, Golden West was not properly accounting for Pick-A-Pay, or "negative amortization," mortgages until after the property securing the mortgages was sold, which often was months after the company had learned of the default. Wachovia continued this procedure until the fourth quarter of 2007 when the company finally changed Golden West's method of recording losses on past-due loans. For further information, please visit the settlement website at http://www.wachoviaequitysettlement.com. The Securities and Exchange Commission charged Wachovia Bank N.A. with fraudulently engaging in secret arrangements with bidding agents to improperly win business from municipalities and guarantee itself profits in the reinvestment of municipal bond proceeds. Press Release, Washington, D.C., April 5, 2011 – The Securities and Exchange Commission today announced that Wells Fargo Securities LLC agreed to settle charges that Wachovia Capital Markets LLC engaged in misconduct in the sale of two collateralized debt obligations (CDOs) tied to the performance of residential mortgage-backed securities as the U.S. housing market was beginning to show signs of distress in late 2006 and early 2007. Second, Wachovia Capital Markets misrepresented to investors in a CDO called Longshore 3 that it acquired assets from affiliates “on an arm’s-length basis” and “at fair market prices” when, in fact, 40 residential mortgage-backed securities were transferred from an affiliate at above-market prices. Wachovia Capital Markets transferred these assets at stale prices in order to avoid losses on its own books. The SEC’s order does not find that Wachovia Capital Markets acted improperly otherwise in structuring the CDOs or in the way it described the roles played by those involved in the structuring process. Wachovia Capital Markets has since been renamed Wells Fargo Securities. Wells Fargo Securities agreed to settle the SEC’s charges by paying more than $11 million in disgorgement and penalties, much of which will be returned to harmed investors through a Fair Fund. Wachovia entered into a deferred prosecution agreement with the U.S. Attorney’s Office in the Southern District of Florida and the Asset Forfeiture and Money Laundering Section of the Criminal Division of the Department of Justice to resolve charges that it willfully failed to establish an anti-money laundering program. Today’s agreement is the result of an investigation into Wachovia’s transactions with Mexican currency exchange houses, commonly known as “casas de cambio” (“CDCs”), announced Jeffrey H. Sloman, United States Attorney for the Southern District of Florida, Lanny A. Breuer, Assistant Attorney General for the Criminal Division of the Department of Justice, Mark R. Trouville, Special Agent in Charge, Drug Enforcement Administration (DEA), Miami Field Division, Daniel W. Auer, Special Agent in Charge, Internal Revenue Service, Criminal Investigation Division (“IRS-CID”), John C. Dugan, Comptroller of the Currency, Office of the Comptroller of the Currency (OCC), and James H. Freis, Jr., Director, Financial Crimes Enforcement Network (FinCEN). The agreement also resolves Wachovia’s admitted failure to identify, detect, and report suspicious transactions in third-party payment processor accounts. A criminal information filed March 12, 2010 charges Wachovia with willfully failing to maintain an anti-money laundering program from May 2003 through June 2008, in violation of the Bank Secrecy Act (“BSA”). According to the information and other documents filed with the court today, including a detailed Factual Statement and a Deferred Prosecution Agreement (“the Agreement”), Wachovia failed to effectively monitor for potential money laundering activity more than $420 billion in financial transactions with the CDCs. Offense: The SEC alleges that J.P. Morgan misstated information about the delinquency status of mortgage loans that provided collateral for an RMBS offering in which it was the underwriter. J.P. Morgan received fees of more than $2.7 million, and investors sustained losses of at least $37 million on undisclosed delinquent loans. J.P. Morgan also is charged for Bear Stearns' failure to disclose its practice of obtaining and keeping cash settlements from mortgage loan originators on problem loans that Bear Stearns had sold into RMBS trusts. The proceeds from this bulk settlement practice were at least $137.8 million. J.P. Morgan has agreed to pay $296.9 million to settle the SEC's charges. Offense: Investors in bank's stock and former employees who held stock as participants in employee stock ownership plan (ESOP) brought class action against bank, its officers and directors, and accounting firm (Deloitte & Touche) that performed audits to recover for defendants' alleged violations of provisions of federal securities laws, as well as for breach of fiduciary duties allegedly owed under the Employee Retirement Income Security Act (ERISA). The lead plaintiff in the case is the State of Michigan Retirement Systems. Bear Stearns agreed to a $275 million settlement in June of 2012. A federal judge approved the settlement in November, 2012. Offense: The Bear Stearns Companies, LLC and its subsidiary, EMC Mortgage Corporation, have agreed to pay $28 million to settle Federal Trade Commission charges that they engaged in unlawful practices in servicing consumers’ home mortgage loans. The companies allegedly misrepresented the amounts borrowers owed, charged unauthorized fees, such as late fees, property inspection fees, and loan modification fees, and engaged in unlawful and abusive collection practices. Under the proposed settlement they will stop the alleged illegal practices and institute a data integrity program to ensure the accuracy and completeness of consumers’ loan information. Offense: Morgan Stanley will pay $58 million to affected Massachusetts borrowers and $23 million to the state's pension fund to make up for the investment losses it suffered, and will return $19.5 million to the state's taxpayers. Offense: Agreed to buy back as much as $4.7 billion in auction-rate securities to settle charges that it misled thousands of customers about the risky investments. Offense: The bank failed to make required disclosures relating the $3.8 billion dollar bonus package paid to Merrill Lynch executives when BofA took over the investment firm in 2008. The Judge succeeded in getting the settlement raised from $33 million to $150 million. Offense: The brokerage firm allowed sales assistants to sell securities without being properly registered. Offense: Class action law suit with allegations that Citigroup had deceived its investors by hiding the extent of its dealing in toxic sub prime debt. Offense: Undermined the process that was supposed to check for mortgage fraud in order to push through reckless loans and get higher profits. Passed along subpar loans to the Federal Housing Authority, making "substantial profits through the sale and/or securitization of FHA-backed insured mortgages" while "it wrongfully endorsed mortgages that were not eligible." Erased the records of nearly 1,000 potentially fraudulent loans, and admitted to passing on loans that were "not eligible" for government guarantees. Offense: Failed to disclose vast holdings of subprime mortgage investments that were deteriorating during the financial crisis and ultimately crippled the bank. Offense: Bank agreed to buy back billions of dollars of illiquid auction-rate securities from hundreds of customers. Those customers have been unable to sell the securities, which they thought were as good as cash. Mary Bottari, End Too Big to Fail: New Bipartisan Bill Aims to Prevent Future Bailouts, Downsize Dangerous Banks, PRWatch.org, April 30, 2013. SEC Enforcement Actions - Addressing Misconduct that Led to or Arose from the Financial Crisis, SEC.gov, Accessed May 22, 2013. Gretchen Morgenson, Paying the Price, but Often Deducting It, The New York Times, January 12, 2013. Savage, Charlie, Wells Fargo to Settle Mortgage Bias Case, The New York Times, July 12, 2012. Cyrus Sanati, Wells Fargo to Repurchase $1.4 Billion of Securities, New York Times, November 18, 2009. Kevin LaCroix, $627 Million Wachovia Bondholders' Settlement: Largest Subprime Securities Suit Settlement Yet, dandodiary.com, August 8, 2011. E. Scott Reckard, Wells Fargo settlement over 'pick-a-pay' home loans is challenged - Wells Fargo failed to reduce the loan balances of thousands of delinquent borrowers as required by a 2010 settlement, a lawyer for the plaintiffs says., The LA Times, December 11, 2012. Reuters, Wachovia and US Settle a Money Laundering Case, New York Times, March 17, 2010. Matt Taibbi, "The Vampire Squid Strikes Again: The Mega Banks' Most Devious Scam Yet", Rolling Stone, February 12, 2014. ↑ Aaron Loudenslager, Time to end ‘get out jail free’ for big bankers, The Badger Herald, March 19, 2013. ↑ Sen. Bernie Sanders, Too Big to Jail?, The Huffington Post, March 28, 2013. 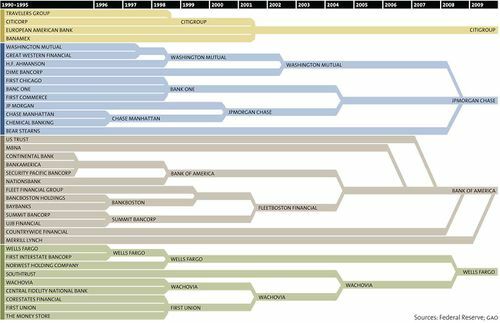 ↑ How Banks Got Too Big to Fail Mother Jones, Jan/Feb, 2010. ↑ Mary Bottari, End Too Big to Fail: New Bipartisan Bill Aims to Prevent Future Bailouts, Downsize Dangerous Banks, PR Watch, April 30, 2013. ↑ Peter Schroeder, Holder: Big banks' size complicates prosecution efforts, TheHill.com, March 6, 2013. ↑ Gretchen Morgenson, Paying the Price, but Often Deducting It, The New York Times, January 12, 2013. ↑ 7.0 7.1 About the Mortgage Settlement, Organization Website, Accessed May 16, 2013. ↑ Business Profile, Wells Fargo & Company News, The New York Times, Accessed May 24, 2013. ↑ Wachovia is Now Wells Fargo, Organization Website, Accessed March 29, 2013. ↑ SEC Press Release, SEC Charges Wells Fargo for Selling Complex Investments Without Disclosing Risks, sec.gov, August 14, 2012. ↑ DOJ Press Release, Justice Department Reaches Settlement with Wells Fargo Resulting in More Than $175 Million in Relief for Homeowners to Resolve Fair Lending Claims, Justice.gov, July 12, 2012. ↑ Jake Bernstein, ProPublica, Wells Fargo Agrees to Pay $590 Million To Settle Class-Action Lawsuit, Business Insider, August 9, 2011. ↑ Wachovia Preferred Securities and Bond/Notes Litigation Website, Accessed May 24, 2013. ↑ Kirby McInerney LLP Press Release, Kirby McInerney LLP Announces $75 Million Settlement of Securities Class Action Against Wachovia, kmllp.com, December 6, 2011. ↑ SEC Press Release, SEC Charges Wachovia With Fraudulent Bid Rigging in Municipal Bond Proceeds, sec.gov, December 8, 2011. ↑ SEC Press Release, SEC Announces Securities Laws Violations by Wachovia Involving Mortgage-Backed Securities, sec.gov , April 5, 2011. ↑ Class Action Lawsuits Database "Wachovia 'Pick A Payment' Settlement" Accessed 2/22/2013. ↑ WaybackMachine, Pick-a-pay settlement website, web.archive.org, Accessed via the WaybackMachine on May 24, 2013. ↑ Dan Levine, Wells Fargo to settle lawsuit over pick-a-payment loans, reuters.com, December 14, 2010. ↑ Impact Litigation Journal, Update: “Pick-a-Payment” Class Members Seek TRO to Compel Wells Fargo’s Compliance with Settlement, impactlitigation.com, March 8, 2013. ↑ DOJ Press Release, WACHOVIA ENTERS INTO DEFERRED PROSECUTION AGREEMENT, justice.gov, March 17, 2010. ↑ Office of the Attorney General Press Release, Brown Recovers $1.4 Billion for Wells Fargo Investors in Landmark Settlement, oag.ca.gov, November 18, 2009. ↑ SEC Charges J.P. Morgan and Credit Suisse With Misleading Investors in RMBS Offerings, SEC Press Release, November 16, 2012. ↑ J.P. Morgan to Pay $153.6 Million to Settle SEC Charges of Misleading Investors in CDO Tied to U.S. Housing Market, SEC Press Release, Accessed April 10, 2013. ↑ JP Morgan Unit Settles Alabama Bribery Case, New York Times, November 4, 2009. ↑ Andrew Ross Sorkin, JP Morgan Pays $2 a Share for Bear Stearns, The New York Times, March 17, 2008. ↑ Michael J. De La Merced, Bear Stearns Investors Settle Claims for $275 Million, The New York Times, June 7, 2012. ↑ Chris Dolmetsch, Bear Stearns Settlement Gets U.S. Judge's Approval Bloomberg, November 9, 2012. ↑ Bear Stearns and EMC Mortgage to Pay $28 Million to Settle FTC Charges of Unlawful Mortgage Servicing and Debt Collection Practices, FTC Press Release, September 9, 2008. ↑ Morgan Stanley to Settle Case Over Subprime Loans, New York Times, June 24, 2010. ↑ Rick Rothacker and Aruna Viswanatha,Bank of America, other banks move closer to ending mortgage mess, Reuters, January 7, 2013. ↑ Rick Rothacker and Karen Freifeld,Factbox: BofA's mortgage problems not over yet, Reuters, January 7, 2013. ↑ Bank of America Announces Settlement with Fannie Mae to Resolve Agency Mortgage Repurchase Claims on Loans Originated and Sold Directly to Fannie Mae Through December 31, 2008 Bank of America Press Release, January, 7, 2013. ↑ Dealbook Bank of America Agrees to Buy Back Auction-Rate Securities, New York Times, October 9, 2008. ↑ About Us, Organization Website, Accessed March 29, 2013. ↑ Louise Story Judge approves SEC Deal with Bank of America, New York Times, February 22, 2010. ↑ Kevin Kingsbury Merrill to pay $26.5m to Settle Sales-Practice Probe, Wall Street Journal, September 8, 2009. ↑ Alistair Barr & Steve Goldstein, Bank of America to buy Countrywide Financial - Paying $4 billion, entirely in stock, to become nation's top mortgage lender, Wall Street Journal - Market Watch, January 11, 2008. ↑ Halah Touryalai, Citi To Pay $590 Million To Burned Shareholders In Toxic Asset Case, Forbes.com, August 29, 2012. ↑ Cora Currier How Citibank Dumped Lousy Mortgages on the Government, ProPublica, February 20, 2012. ↑ Eric Dash & Louise Story Citigroup pays $75 million to Settle Subprime Claims, New York Times, July 29, 2010. ↑ Liz Rappaport Citigroup, UBS Settle Deal on Payback, Wall Street Journal,. December 12, 2008. This page was last edited on 12 October 2017, at 18:13.